That is the word that comes straight to our minds when we stare at the 917. We have always been in love with her: her sublime lines, her colors, the whispering of the air pushed by her turbine, the purr of her flat engine... And if that was not enough she is even a winning car with a lot of history. All in all, a true myth, whose reedition by Fujimi we are premering this week. As we say at SpotModel: one of the classic iconic kits that every scale modeler worth his salt should build at least once in a lifetime. SpotModel is serving it in a tray... do you fancy? 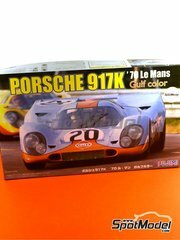 One of the most iconic Le Mans cars, the Porsche 917, finally reedited by Fujimi using the Gulf decoration during 1970. 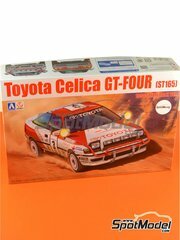 Without any doubts, this is one the classics and most renowned kits of the brand, and every proper scale modeler should built at least one in a lifetime. This kit does not include a detailed engine. The Monza 1000 km. 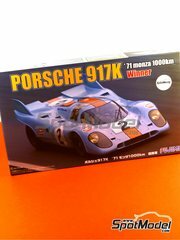 1971 winning car, now finally reedited by Fujimi. Without any doubts, this is one the classics and most renowned kits of the brand, and every proper scale modeler should built at least one in a lifetime. This kit does not include a detailed engine. 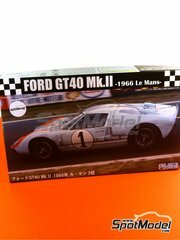 One of the most iconic GTs ever raced at Le Mans, the GT40, the one that finished second in 1966 wearing Gulf blue. The kit also includes photoetched parts for the rear grid, bonnet pins and seat belt buckles. 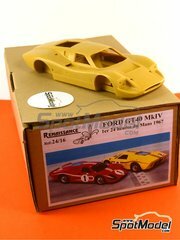 Gorgeous resin kit of the GT40 finishing in 1st and 4th place in 1967 Le Mans 24 hours. The kit includes resin parts, white metal parts, pre-printed acetates, vacuum formed parts, turned metal parts, Interdecal printed decals and photoetched parts both in brass and steel. 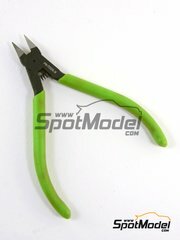 Cutting pliers made of top quality steel and PVC covered to ease gripping. Pre-thinned acrylic paint, ready for airbrush use. 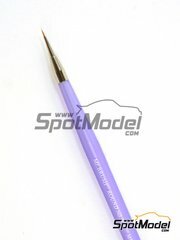 Can be applied directly with a 0.3mm nozzle airbrush. Manufactured by Mr. 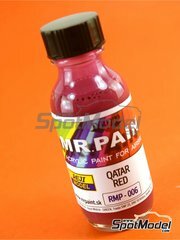 Paint for Reji Model. 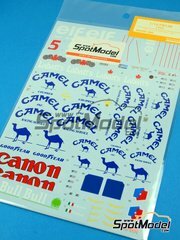 This product includes two decal sheets. One of them, printed in Italy by Cartograf, features printed gold tones using the hot printing technique: simply delicious. 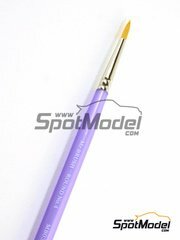 The reference also includes resin parts for replacing both front and rear spoilers on the original scale model. 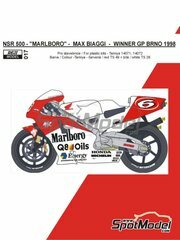 Decoration for Biaggi's NSR500 at Brno Grand Prix, including all tobacco logos. Finally you can build your old FW11 kit without worrying about the yellowish decals. 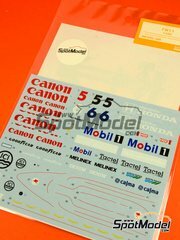 This reference from Shunko Models includes every decal you need, with all sponsor logos redesigned and printed with full details. 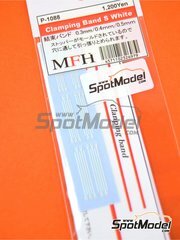 A new reedition by Shunko of this Mercedes Benz AMG decoration at the DTM for the Tamiya kit. 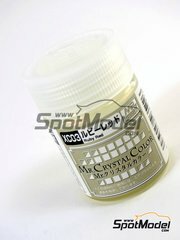 Mr. Cristal Color range colors change their looks based on the underlying color. 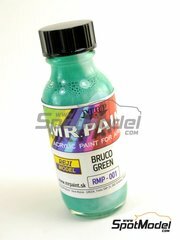 Using a white color base you get a pearlescent green, while using a black color base you get a metallic green. 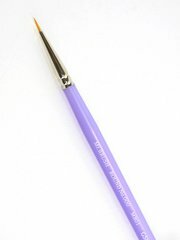 You can also get a more glossy look applying more than one coat. 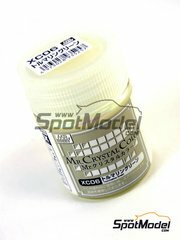 Mr. Cristal Color range colors change their looks based on the underlying color. Using a white color base you get a pearlescent red, while using a black color base you get a metallic ruby red. 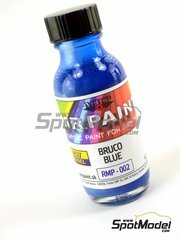 You can also get a more glossy look applying more than one coat. 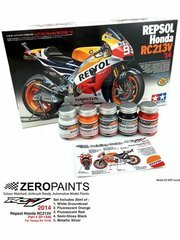 Set of 5 specifically formulated colors for painting the Repsol Honda RC213V during 2014 season. 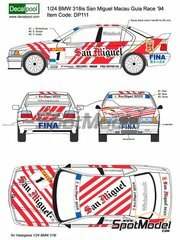 The set includes the following colors: white, Repsol fluo orange, red fluo, satin black and metallic silver. 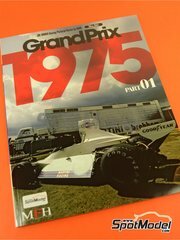 In this first volume about 1975 Championship, we can enjoy pictures of the following races: Swedish Grand Prix, Dutch Grand Prix, French Grand Prix, British Grand Prix and United States Grand Prix. This issue features 108 total pages focusing mainly on Ferrari, Brabham, March, Penske, BRM and Maki teams. 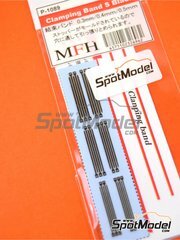 Each package contains 30 zip-tie strap bands in assorted measures, targeted mainly to 1/12 scale models, but can also be used in 1/20 and 1/24. Scale model kit of the 1990 Safari Rally winner, featuring several sprues in white, transparent and chromed plastic, decals, paint masks for windshield and windows, and a silver sheet for veiling the rear windshield.